Names over at BMW are tricky these days. That BMW M235i that Jason drove? It's not officially a "real" M-car, and it's certainly not to be confused with the 225i Active Tourer, which is front-wheel and has a Mini Cooper engine. But! A real M-ed up 2-Series might be coming. LeftLaneNews reports that a proper BMW M2 (again, which is not the M235i, God my head hurts) may be on its way for 2016. 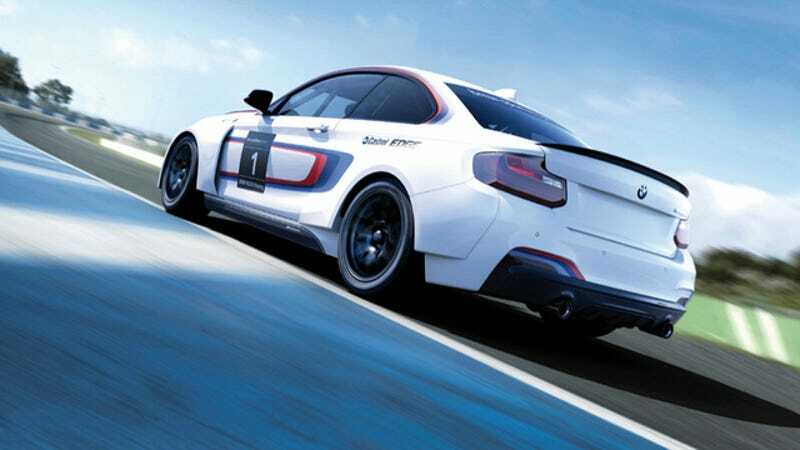 They say it could look like the M235i Racing, pictured above, and that would not be a bad thing at all. What's she got under the hood, you ask? We don't know for sure yet, but LeftLaneNews predicts a twin-turbo version of the 3.0-liter straight six in the M235i boosted to somewhere between 380 and 400 horsepower. That seems about right with the new M3 and M4 putting out 430 horses. They also predict it could cost around $55,000, which puts it in the same range as the Mercedes CLA45. The Bimmer could have the advantage there because it has more power, rear-wheel drive and two extra cylinders. Should Benz be worried? Will the M2 become a reality? And why can't I keep these names straight?